Rack Size 15 X 12 5/8"
The steel cookbox is warranted against defects in materials and workmanship for a period of five (5) years. The stainless steel grates and all other parts & paint are warranted for a period of two (2) years. For my first smoker, this was the best gift I received in May 2017. I've used it many times in all season and was never disappointed. Today here in Edmundston NB it is -24c with wind chill of -35c and I have a pork shoulder smoking with apple wood whisky mixture marinade and infusion. This smoker is real Canadian Icon. I bought this smoker a little over a month ago and have now completed my third smoke with it. Have done ribs, pulled chicken, smoked salmon, and canadian bacon. The smoker worked great each time. Very easy to maintain a constant temp and virtually no leakage of smoke. Easy to access the fire box. It would be nice if there was a port to allow temperature probes to be inserted into the smoker but I just ran them through the door seal with no problem. Unit is well made and I look forward to many years of great use. This is the first smoker I have owned. It was easy to put together; instruction were well written and easily understood. The quality of the product is exceptional, especially considering how inexpensive it is compared to similar products. Parts are easy to clean. The wheels allow for easy movement. 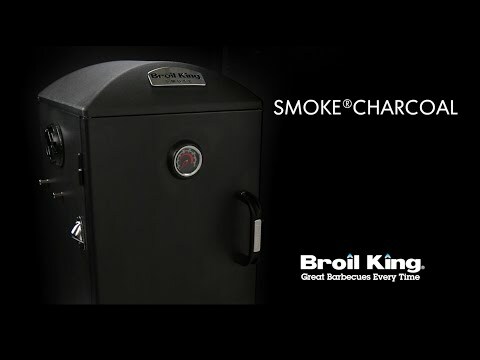 As a beginner smoker, I have enjoyed learning with my Broil King! So far I have smoked pork ribs, chickens, chicken pieces, sausage, and pork butts. All turned out fantastic, with my wife commenting that the ribs where "the best I ever had!" Very good quality. I've only used once to smoke some chicken wings. Turned out great! Looking forward to more smoking! Bought this about a month back and so far it's been turning out some fabulous low and slow food. Would recommend to anyone looking for vertical style smoker. I've had the best performance removing the smoke chip box and lowering the water pan to the middle rack level so I can easily slide it in and out to add water. The initial setup height made it difficult to slide out to add water once it was hot. Using chunk wood now which I just add to the charcoal for the beautiful smokey taste. Performance of my Broil King gasser convinced me to take a chance on this new smoker. Definitely worth it. Just got this unit a week ago. Assembled it in an hour and a half .I am impressed with double wall construction, and doors the seal shut. I just cooked some of the best ribs I have had in quite some time. I have been smoking meats on an offset vertical smoker that I got about 10 years ago and just plain wore it out. I always had good results but it took a lot of wood and charcoal. The Broil King used about 1/5 the fuel and what was more surprising was I probably got as good a batch of ribs as any I have smoked in the last 10 years,on my very first try. This is well worth the money. 15 X 12 5/8" 22 1/2 X 22 1/2" 18 1/2 X 18 1/2" 14 1/2 X 14 1/2"